Each month, the Modern Original Products company (www.mopproducts.com) features an industry leader or icon in its “Modern Original People” blog. 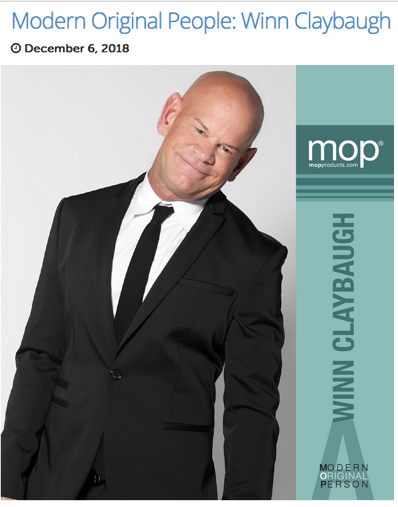 December 2018’s featured guest is Winn Claybaugh, dean and cofounder of Paul Mitchell Schools and author of Be Nice (Or Else!). At MOP, we believe in high-fives, positivity and mutual respect. We want to create, contribute to, and be part of a culture where humans are free to express themselves without fear of judgement. We believe in love not hate, acceptance not bullying, equality for all, not to mention awesome hair products with beautiful ingredients for your “mop”. Share your own Modern Original Perspective with us @MOP_Hair_Products and #showyourmop. The Temple Honored By Modern Salon Media for Excellence In Education! MODERN SALON Media has named the 2017-18 class of “Excellence in Education” honorees in its seventh annual program recognizing leadership and best practices among cosmetology schools. The Temple Annapolis: A Paul Mitchell Partner School was chosen to represent excellence in marketing. Honorees were determined based on key criteria in each category and grouped according to number of locations. Honorees were chosen in each category—one individual school location, and a multi-location school organization. “We received applications from cosmetology schools across the country and look forward to celebrating all the 2017-18 Excellence in Education honorees and sharing their stories. It is truly a great time to pursue a beauty education and career, and the program at The Temple Annapolis: A Paul Mitchell Partner School exemplifies that fact,” MODERN SALON Editorial Director Michele Musgrove says. Do Something Today To Create The Career You’ve Always Wanted! It is easy to dream about a better future, but do you have the motivation to make it happen? The career you envision is right around the corner and only YOU have the power to make your dreams a reality! Do something today that your future self will thank you for… begin your beauty career at The Temple Annapolis! The Temple Annapolis: A Paul Mitchell Partner School offers education far beyond the technical training you need to succeed in the beauty industry. One of the premier Paul Mitchell schools in the nation, we’ve helped over 1,700 graduates achieve their goals. We use a unique multifaceted approach that gets you up and out of your chairs and working hands on from the first day of class. Using the latest technology, hands on instruction, live demos, lectures -even music- in every lesson! Wondering about the enrollment process and what it takes to get started? What are you waiting for? Changing your life is easier than you think! Temple Annapolis: A Paul Mitchell Partner School was thrilled to host “A Day of Inspiration” for Future Professionals featuring Winn Claybaugh and Tim Storey this fall! Winn Claybaugh is the author of Be Nice (Or Else!) and “one of the best motivational speakers in the country,” according to CNN’s Larry King, who wrote the foreword for the book. A national speaker for major corporations and a business owner for more than 30 years Winn is the founder, co-owner, and dean of Paul Mitchell’s school division. Under Winn’s leadership Paul Mitchell Schools have donated countless volunteer hours and raised more than $18.2 million for multiple charitable organizations. Tim Storey is an acclaimed author, speaker, and life advisor known for inspiring and motivating people of all ages, faiths, and walks of life. Quincy Jones called him “the voice of encouragement to our generation.” Well known for inspiring and motivating people of all walks of life, from entertainment executives, celebrities and athletes to adults and children in the most deprived neighborhoods in the country, Tim has also appeared numerous times on Oprah Winfrey’s Super Soul Sunday. Up To $35,000 In Scholarship Opportunities for 2018! The Temple Annapolis: A Paul Mitchell Partner School is thrilled to announce that we’re giving away up to $35,000 in scholarships in 2018! Each year, thousands of students and staff members from the nationwide network of Paul Mitchell cosmetology schools donate their time, talent and energy to support a variety of charitable causes, raising and donating over $15.2 million in the past 12 years. Because of our commitment to a culture that gives back culture and a dedication to supporting those who serve their communities, we will once again take part in a national Paul Mitchell Schools campaign that will award over $1 million in scholarships! Qualified applicants must submit the required information to the admissions department, enroll in the specified class, and maintain satisfactory academic progress to maintain eligibility for the scholarship award. For complete details about the opportunity and requirements, download the application. *Scholarships may also be awarded to students interested in other classes on a case by case basis.